A few months ago I was surprised to read an interview with the British actress Emma Thompson–not about her acting, or producing, or screenwriting, or whatever, but about her having acquired a pasta machine so that she and her family could have fresh pasta at home. What surprised me is that she called it a revelation, or revolutionary, can’t remember which. I think it came up in relation to a short dramatic interpretation of a poem called “Song of the Lunch” that she and Alan Rickman did for the BBC last year. It’s about 20 minutes long, posted on YouTube in sections but in its entirety, and it’s actually not bad, though not as funny about foodieism as “The Trip”. The main thing about it is that it takes place in an Italian restaurant in London. Hence the pasta issue. Over the course of a misspent youth (which I’m still in, thank you very much) I have tried a number of times to make sheet pasta myself, with varying degrees of success. Buckwheat noodles–grainy and dry. Try this soba recipe instead. Ravioli dough made with half egg, half water (this was a few weeks ago)–grainy, sticky, hard to roll evenly to the right thickness. Yesterday’s classic pasta dough from Marcella Hazan, just flour and eggs–just right. In fact, the only right recipe there is, I’m now convinced. 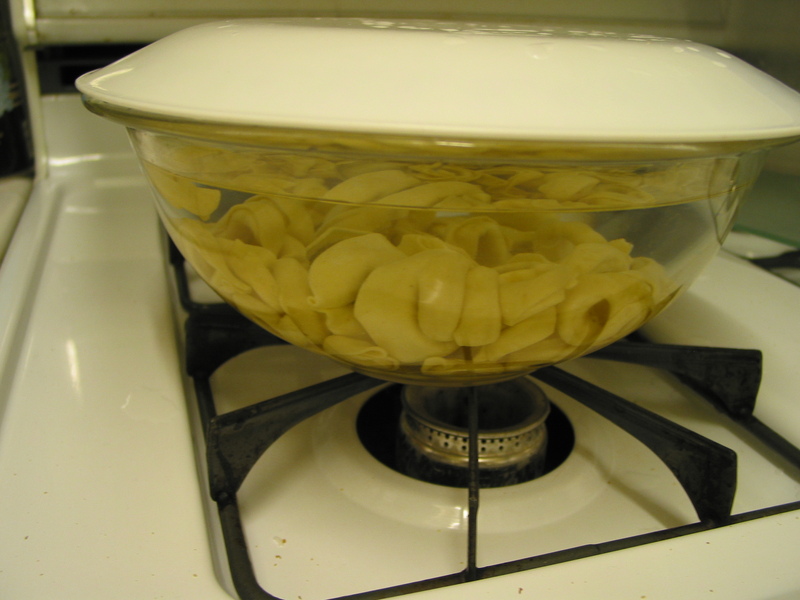 So of course this post isn’t really revolutionary–I’m about 20 years behind the “Wow, you can make pasta at home” trend. And I refuse to call it “a revelation”, as fresh food that includes actual garlic always seems to be for the British. It’s just that it finally worked, came out pretty well, and wasn’t as hard or as time-consuming as I thought. Take it as read. I should back up and say I never actually managed to pick up either a proper cranking pasta machine, even though you can sometimes find one at Ross for Less at under $20, or a proper long dowel-style rolling pin, which Hazan deems necessary for hand-rolling. This still worked very well. Why no pasta crank for the crank? Why no artisan rolling pin? I’m not good about kitchen implements that are hard to store, particularly now that the drawers are out in the garage and the counter space is severely limited. I use an empty wine bottle, the tall hunch-shouldered kind with a long straight barrel and short neck. It stands up in a corner when not in use and doesn’t take up space. I also don’t roll any dough directly, but between two sheets of plastic wrap with a little flour or–my great new discovery, especially for this pasta dough–parchment paper. Works incredibly well, better than the plastic wrap, because it doesn’t wrinkle and stick. In any case, the one kitchen gadget (other than the microwave, the toaster oven, or the coffee maker) that I’m always willing to give counter space to is my food processor (also not fancy–a $30 Hamilton Beach with a big work bowl, not a $200 Cuisinart). Because although I’ve watched my share of “Make Your Own Pasta” cooking demos over the years where Mary Ann Esposito or the guest du jour on Julia Child cracks eggs into a well in a bowl of flour and “incorporates them” gradually, I know perfectly well from hard experience that kneading by hand is going to precede rolling out by hand, and that the food processor will make at least one of these ordeals a lot faster and less of a pain. It will also give me a better product. Pasta needs a lot of kneading–8-10 minutes!–to develop the gluten and get it to a smooth uniform texture that will hold when you roll and stretch it very thin. I’m not that good or that patient. Or at least I wasn’t yesterday.